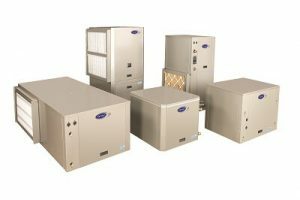 Geothermal AC from Stafford Mechanical Services, Inc.
For incredibly efficient cooling for your home, geothermal air conditioning is the right choice. Your geothermal AC works by absorbing the heat from your home, transferring it underground where the cooler earth absorbs it. Then, the cool water is used by the heat pump to make cool, dehumidified air for your home. Operating costs for geothermal AC are significantly less than traditional fossil-fuel systems. When you choose Stafford for geothermal air conditioning for your home, you can count on our expert technicians. They are highly trained and licensed, so they’re qualified to provide you with the services you need. They’ll install your geothermal system professionally, so you can rely on it to keep you and your family cool and comfortable this summer and for years to come. Stafford is pleased to offer geothermal AC for your home. When you need geothermal AC for your home, count on Stafford Mechanical Services, Inc. to assist you. We proudly service Carrier AC or any other brand. You may contact us via phone at (860) 684-9485. We look forward to helping you with all of your air conditioning needs.